Woooooow, what a wonderful book! I’m not even sure if I can describe all the precious moments and knowledge this book gave me. Hopefully my opinion will inspire you to borrow this book from The American Library in Paris so you can get delicious and calming food for the mind. Let me start with the opinion that An American (Homeless) in Paris by Chris Ames is probably not your typical American in Paris book. Why? This is a book about a life of a man who was in one moment of his life living in Paris, in a tent, homeless. You can already see from the subject that this is going to be rollercoaster of different life situations, emotions, people, cultures, and quiet deep hidden thoughts and wisdoms – some which are sometimes forgotten or avoided in today’s world. The book is written in a interesting way. It’s divided into different chapters, one chapter for each month; starting from November and finishing at October. Each chapter starts with Mr. Ames’s experience from his trip through Asia in the past and continues with the events in the present, drawing connections from past experiences to present. What I like about this book is honesty and how we can see Mr. Ames as a human. There are no lies, he is not trying to make the truth nicer. We can read about him choosing a place where to place his tent, organizing it, going to the job every morning, cleaning himself, preparing the food and eating, creating toilet, we can read about his social connections, his family and lovers, every small thing that makes us human. In this book Mr. Ames showed me how often times I don’t see, I don’t realize all the wonders of life, how often times I take things for granted. Every morning I take shower before the job, I just jump from my bed to the bathroom and turn on the pipe and here is hot water. Mr. Ames subscribed to the public pools where he could go and take a shower there. I have oven, microwave, different gadgets for preparing the food, electricity. Mr. Ames needed to create fire or burn a gas cooker to prepare his food. I have radiators, hot water, Mr. Ames only had his blankets and clothes to be warm. I have couple of lock on the doors and Mr. Ames only a zip. And million other small everyday situations which I took for granted, about which I don’t even think about. This book made me appreciate them more. Second thing Mr. Ames showed me is living in a moment, he lives in NOW, and shows us all the magic of life and being a human. Every moment in our life is precious and every situation is a teacher. We just need to open our eyes and it will be so clear. In this book you can find different face of Paris – author is writing about other homeless people who he meets in his life, on a way to the job and “home” – he puts a face on them, a name, the back story. He is communicating with them, and even if it’s not everything pink and roses in his or their life, they communicate, they are not “invisible” to each other. This book will make you ask yourself how do you see homeless persons or persons begging for money or food to stay alive – do you really see them or are they “invisible”. 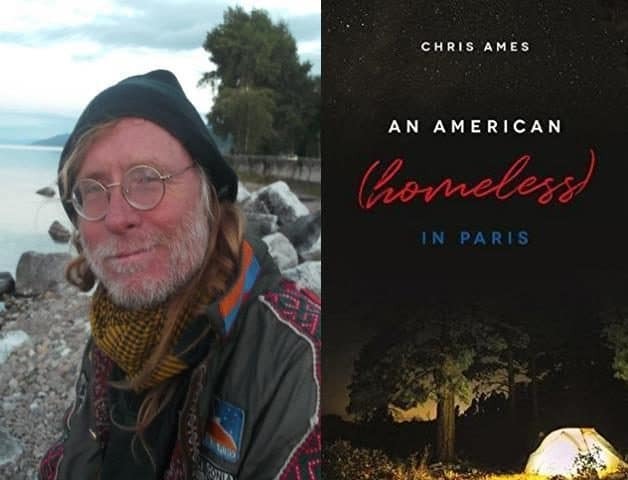 Mr. Ames will also give a lot of comment about different parts of Paris and it’s looks and architecture and his emotions about living and being a part of this city. Mr. Ames awoke wide range of emotions in me with his life story, adventures and his writing style. This book made me laugh like crazy, made me scared and worried, sometimes sad, but at the end there is always peace and acceptance about whatever life is bringing us. This feelings made me turn page after page, made me learn so much about myself and other people and made me understand that it’s OK to be person who you are. For the end, I must say that I was very sad when the book ended, I wish if it could go on and on. I hope that Mr. Ames will write prequel or sequel of his story. This book, his life story is so beautiful that I recommend this book to everybody! Five stars book! My wife and I really enjoyed Bojan’s heartfelt review. It made us also pause to appreciate our own good fortune which he expressed so well. Thank you for sharing this comment for the book review, we are glad you enjoyed it. Winter holiday hours: The Library will be closed from Tuesday 24 December 2019 until Wednesday 1 January 2020, inclusive. We will reopen on Thursday 2 January 2020 at 10h. Paris’s self service “bike hire” system.